Now that nice weather is here to stay, lets celebrate the beginning of summer with a classic Caprese Salad. This classic Italian dish is often served as a light starter with fresh mozzarella, sun-ripe tomatoes and savory basil topped with a high quality olive oil (Arguably, it’s easier to get good quality olive oil in Italy than it is in North America, but if you look around a bit, you can find some hidden gems). 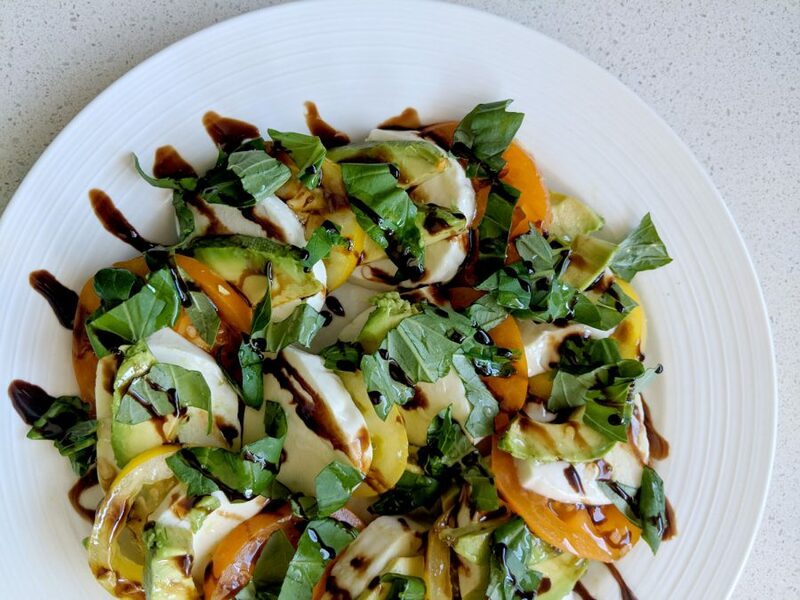 My variations on the Caprese Salad, include avocado and good balsamic vinegar to add some sweetness and extra heart healthy fats (and besides, the window for good quality avocados through the year is so limited! I try to use them when they’re in season). Because this recipe is so simple, the secret to making it great is the quality of the ingredients. The fresher and higher quality the ingredients – the better it will taste! I’d suggest hitting up your local farmers market or your favorite independent grocer to take advantage of the best that the summer and the local farming community has to offer. *Chiffonade is the fancy way of saying “cut into long, thin strips”. To do this, take a leaf of basil and roll it up length wise from leaf tip to bottom (like you would roll up a piece of paper). Carefully cut thin strips along the rolled up leaf (like you’re cutting up a sushi roll). This technique allows you to cut strips of leafy herbs without bruising the leafs, and it keeps your cuts nice and consistent. **The longer balsamic vinegar ages, the sweeter it tastes, the less acidic it is and the more viscous it becomes. This makes the salad more enjoyable than using cheaper balsamic vinegar, but the cheaper stuff will still work. If you don’t have good quality vinegar, another alternative is to use Balsamic Crema (a reduced version of Balsamic Vinegar). ***Good quality olive oil, like quality extra virgin olive oil, as a more distinct taste and enjoyable texture. Again, you can use whatever oil you want, but the high quality the olive oil, the better it will taste. On a plate, or serving platter, layer the mozzarella, tomato and avocado slice by slice in a circular motion until you meet up with the original piece. Place any additional pieces layered in the middle of the circle. Sprinkle with salt, pepper and the basil. Drizzle evenly with the oil and balsamic, trying to touch every piece on the platter.